Today I am thrilled to spotlight on the beautiful bespoke wedding stationery of Designed by Sarah. 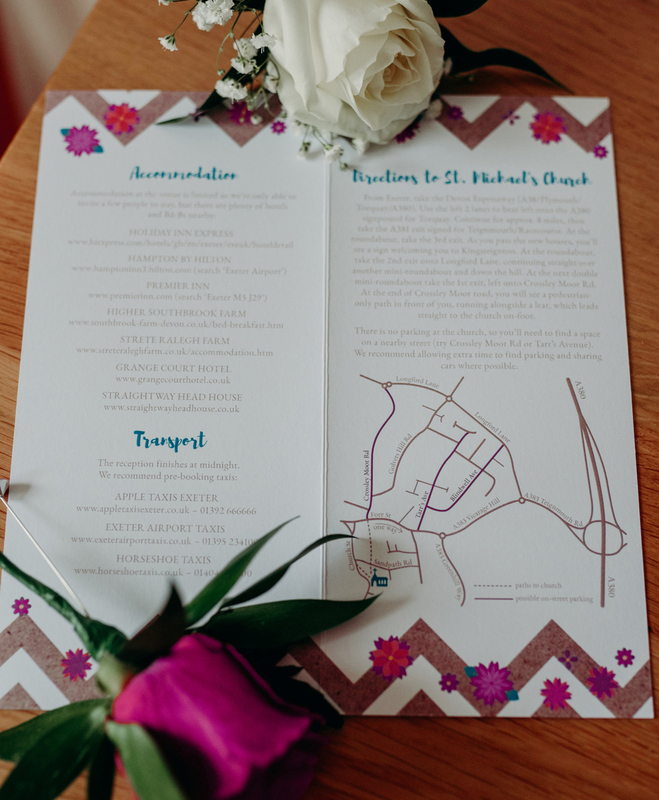 Sarah is a qualified Graphic Designer based in Exeter, offering bespoke design of Save The Dates, Invites & RSVPS, Order of Services, Menus, Table Plans and more..
Hi! 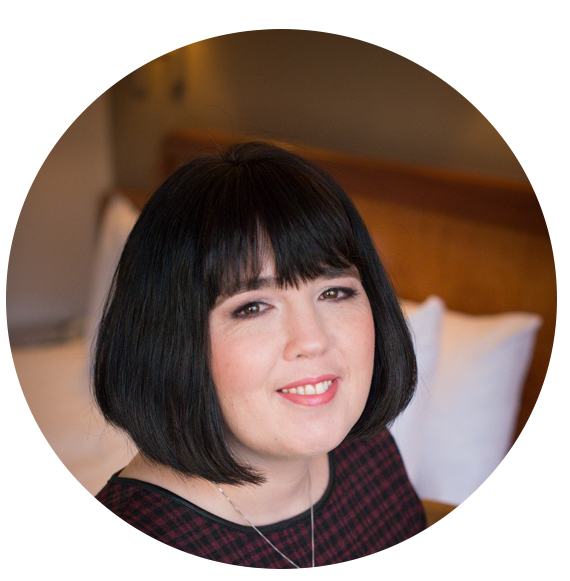 I’m Sarah Porter, my company is called Designed by Sarah and I create bespoke wedding and event stationery. I’m a qualified graphic designer based in Exeter, with over 11 years’ agency experience, both in the UK and Australia. In my career as a designer, I’ve been lucky enough to work with a wide range of clients, both large and small. I’ve worked on all sorts of projects, including: logos and branding, brochures, leaflets, adverts, exhibition banners and web design. This has allowed me to experiment with a huge variety of design styles over the years and to perfect my typography and illustration skills. I’m now taking all of this experience and feeding it into my own venture, Designed by Sarah. The service is creating beautiful bespoke wedding stationery for people who want their special day to be as unique as them, and recognise the value of a personalised design. There’s no one-size-fits-all, so I listen to what’s important to the client. I discuss ideas for themes, colours, styles and any elements which will make their wedding design as special and individual as it deserves to be. I got married in June this year and spent months in the run-up designing and making everything for our big day. 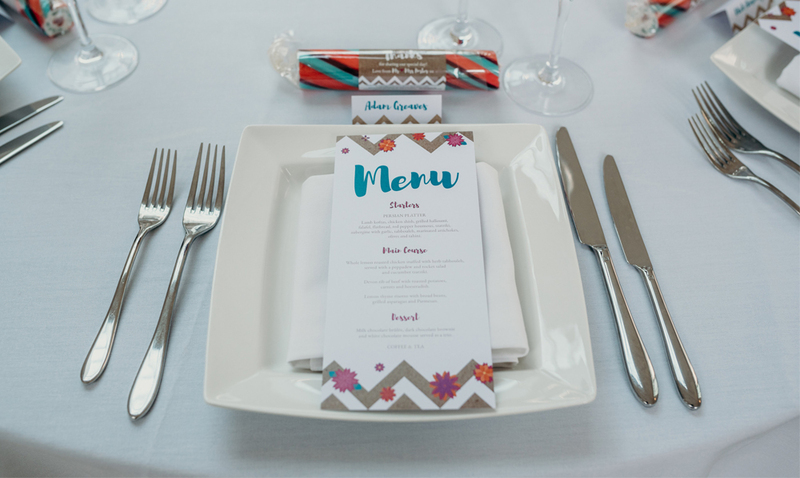 I designed all the standard printed material like ‘Save the Dates’, invites, menu cards, place cards and the Order of Service. 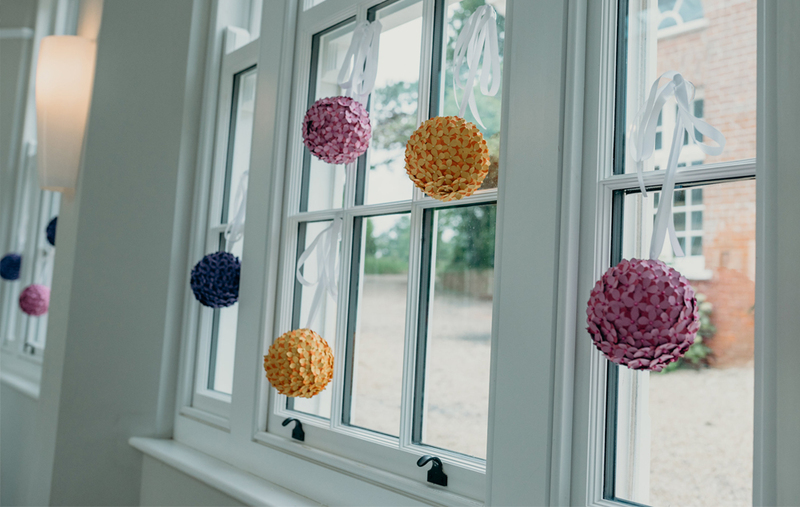 But I also got hands-on, creating floral decorations out of felt and paper, as a backdrop in the venue, and to feature on various items such as the table plan and guest book. 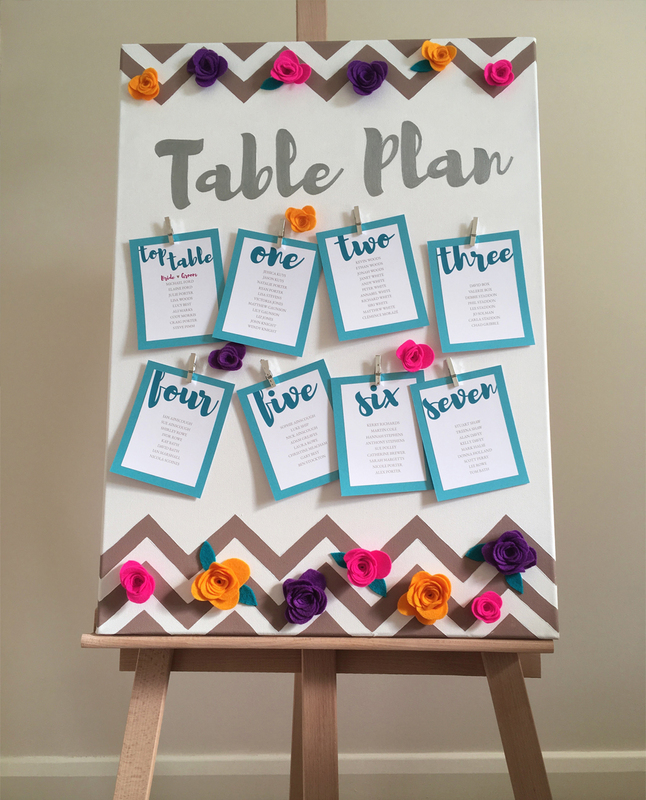 As an ode to my hobby of painting, I painted our table plan, table numbers, and various other items onto canvases of different sizes and displayed them on easels. I enjoyed the process of designing our wedding stationery and decorations so much that I knew I wanted to continue doing this for other people after our own wedding. 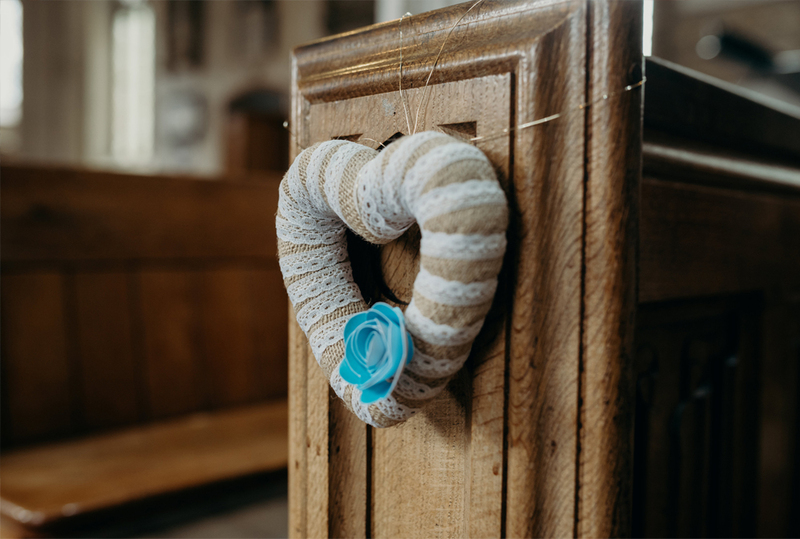 I realised my skills and background in design, as well as my experience of the wedding process, made me perfectly-placed to offer this service to other brides and grooms. I’m inspired by the desire to create something beautiful that has meaning. When I take a brief from a client, I love the process of identifying themes, colours and ideas that can be weaved together to create a unique design. More broadly though, I’m inspired by so many things daily: from window-displays in shops (a frequent favourite of mine being ‘White Stuff’. Even though I don’t tend to shop there, I can’t help but appreciate the creative backdrops and installations as I walk past), to quirkily-designed menus in restaurants, music videos, film credits, billboards, beautiful homewares… the list goes on. As well as keeping up-to-date with wedding design trends, I try to draw inspiration from the widest variety of sources possible. I pay attention to new trends. As a designer, I always want to be creating something different though, rather than replicating something that’s been done before. When I notice a trend that inspires me, I’m thinking of ways I can incorporate it into future pieces of work, but with a unique spin. I think that being in the design industry for over 11 years and still having the same excitement to create something new and beautiful every time I sit down to start a new project is an achievement in itself. I’ve been drawing and designing things pretty much since I was old enough to hold a crayon, so I feel like it’s a real achievement that I’ve been able to mould a career out of my hobby…and still enjoy it! Designed by Sarah, as a bespoke wedding stationery design service, is in its infancy, so I’m excited to see how it will expand and develop over the coming years. I hope to work with a variety of clients and create work that couples will treasure long past the big day itself. Recommendations are the best reward, so I aim to exceed expectations with the quality of my work and expand through word-of-mouth. Its so lovely as a guest to receive something so pretty in the post. 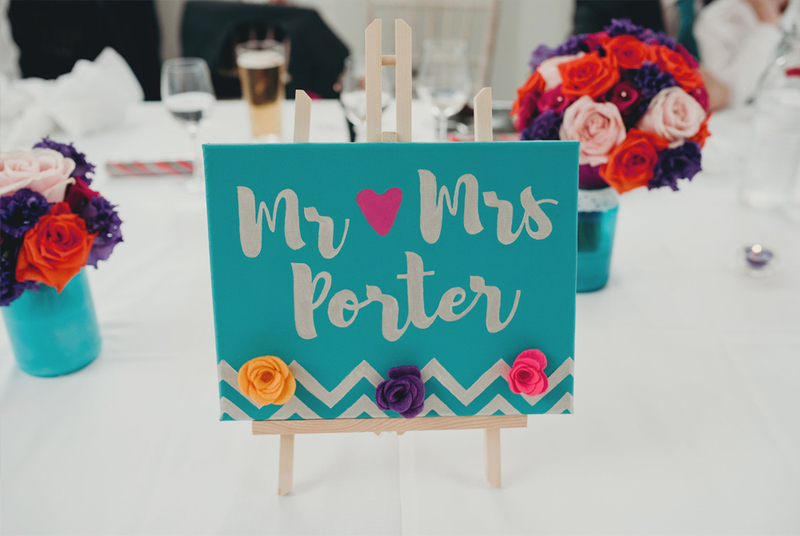 Wedding stationery is the first insight your guests have to the style of your day and I adore these vibrant bold designs.